The membrane ultrafiltration filter is a kind of equipment to purify water by ultrafiltration technology. Different from other water purification equipment, this equipment applies ultrafiltration membrane. This water treat equipment utilizes new hollow fiber ultrafiltration technique and three-grade pretreatment filtration to remove impurities in running water. Ultrafiltration micropore that is smaller than 0.01μm can completely filter out germ, rust, colloids, and other hazardous substances in water. Besides, microelements and mineral substances that are beneficial to human body are reserved. The impurity hyperconcentration water goes out through drain valve. Hollow fiber membrane allows huge water yield and is difficult to block up. The fiber elements can be cleaned repeatedly and enjoy long working operating life. Besides, ultrafiltration is driven by running water pressure, thus electricity is saved. And it is convenient to replace fiber elements. The equipment is a kind of membrane ultrafiltration filter and its water output capacity is 4M3/H. Founded in 2006, our company is a leading manufacturer and supplier of membrane ultrafiltration filter in China. Here in Topling, we mainly offer bottled water filling line, juice filling production line, carbonated drink filling line and related equipments including rinsing filling capping machine, reverse osmosis, shrink packing machine (shrink-wrappers), and other related machines. We offer installing and debugging services of our devices and staff training for factories abroad and OEM service. For more guides of membrane ultrafiltration filter or our other products, please contact us. 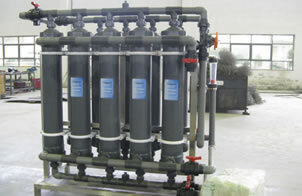 Reverse Osmosis EquipmentThe reverse osmosis equipment (RO equipment) is main component in water purification system. This equipment can remove most of inorganic salts, and almost organic matters and microbes in water.